A great player, played in the WCHA before going on to Calgary. 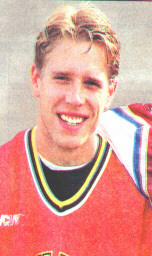 He played for the University of Denver Pioneers for four years, carrying them to the NCAA playoffs his senior year. His team was knocked out of the playoffs when Boston University player Chris Drury (who now plays for Colorado) scored in overtime. He's a awful nice guy- very soft spoken and looks like he could be in a shampoo commercial with his great hair(so healthy, it shines!). Was playing with Calgary his first year until he got knocked hard by Adam Deadmarsh (a lot of Colorado connections, lemme tell ya!). After that he was sent to the minor league team. But he will be back! !